You may find this surprising, so sit tight. As anyone who knows me knows, I love seafood. All of it, cooked or raw. However, fried seafood is definitely at the bottom of my list. Also, there is ONE thing from the sea I can think of that I just hate: Whole Belly Clams. I love clams: Steamers, littlenecks, cherrystones and even fried clam strips. But the clam bellies are just gross. I mention this off the bat because Roadfood says that the Sea Swirl’s whole bellies are THE way to go here. Well, this is my blog and I’m taking the minor liberty of switching to the fried clam strips away from the whole belly clams. Sorry… And besides, as you’ll read, Mr. Stern also took some liberties 10 years ago in his online review that he sort of corrected in his “Eat Before You Die” book some eight years later. the Sea Swirl’s case. But no matter, the Swirl gets so many accolades from such luminaries as the New York Times, Esquire and Rachel Ray (ahem), that location should certainly not be a deterrent. We stopped by for lunch after another typical CTMQ Saturday of a winery and a museum, with appetites that demanded to be sated. 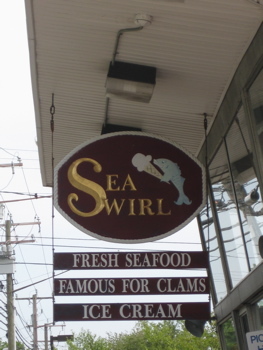 A former Carvel stand on Route One east of Mystic, Sea Swirl might seem like an unlikely place to find four-star food. 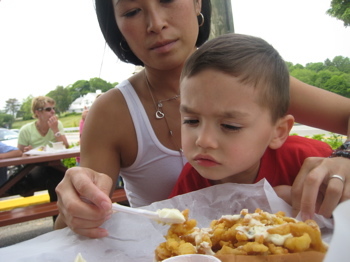 But for many years now, it has sustained a deserved reputation as one of the finest places this side of Ipswich to eat fried clams, especially the whole-belly variety. They are ocean-sweet with a salty snap to the meat inside their brittle crust. With a side of fries and a soft drink, they are a fine summer meal. Beyond clams, Sea Swirl serves a full roster of expertly-fried seafood, including scallops, shrimps, and oysters. For the fish frowner, there are hamburgers which look pretty darn good (but which we’ve yet to sample). 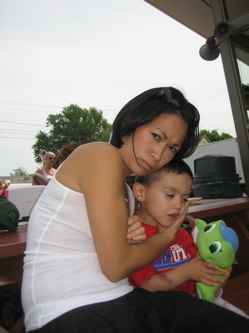 Some locals think of Sea Swirl as an ice cream place first, and there is a full menu of ice cream desserts, from cones to jumbo sundaes. It isn’t gourmet ice cream, but it has an ingenuous cheap-eats charm perfectly in keeping with the democratic spirit of Sea Swirl. As for atmosphere, it is quite literal, for you can smell the ocean and flood tide to the side and back of the restaurant. 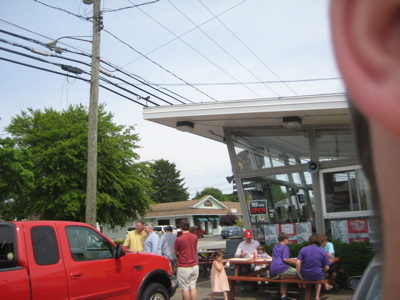 The view from some picnic tables also includes a good perspective on whatever automobiles are cruising back and forth along Route One, which can be an inspiring sight on weekend evenings. Among your dining companions will be seagulls who apparently can find nothing good to scavenge at Mystic Seaport and so hover in the air above Sea Swirl, hoping to dive-bomb for any unattended French fries or pieces of fried clam. At the Sea Swirl, you want to call the fried clams debonair; they feel so fine and lithe when you heft them from their cardboard container. 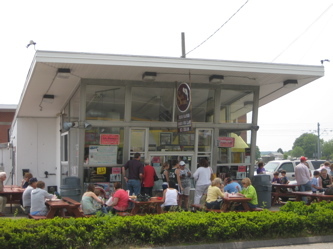 Sea Swirl also offers irresistibly downscale clam shack atmosphere, with picnic tables sandwiched between Route 1 and an auto supply store and its best seats providing a view of the restaurants storage area and such scenic wonders as giant drums of Eat-It-All Twinkle Cote ice cream topping. Hm. Times change as critics become more critical as they gain credibility. I know the feeling. 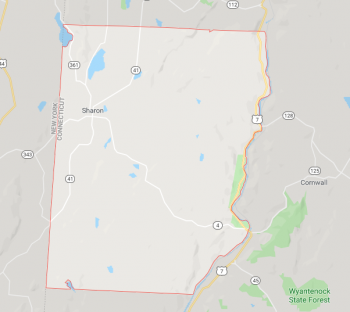 (Another picky thing, it’s not really on the ocean, but rather in a stagnant inlet – though technically I do think Mystic fronts the Atlantic Ocean rather than the Long Island Sound. Yes, I know they are the same thing more or less. I won’t harp on the location too much, but if you’ve got a little kid, you better be wary. The parking lot is a mess and the main roads it’s on are not pedestrian friendly. The menu of fried seafood is fairly extensive, but we stuck with what Roadfood told us to stick to: Fried clams. 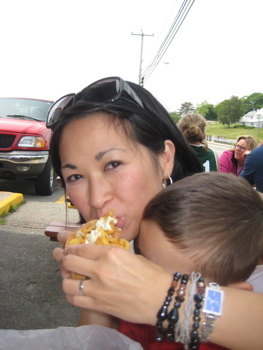 Specifically, fried clam rolls. I also ordered some fries I think, but that’s not important. Despite the crowds, our wait wasn’t too long at all, and we took a seat next to Route 1. Hey man, this is Americana. Now all we needed was a bunch of Harley guys with loud mufflers to cruise on by… Yup, that happened. About five times. And that’s where we were. 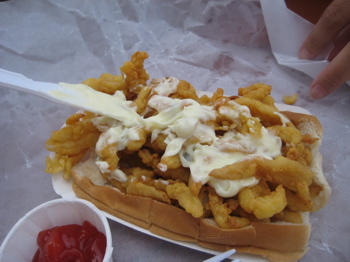 There is another clam roll on the Roadfood list, down I-95 a bit at Lennie and Joe’s in Madison (CTMQ Visit here). It’s tough to compare the two having eating each almost a year apart, but both offerings are of the highest quality. What makes a fried clam strip high quality? Three things: Bigger clams, lighter breading, clean oil. That’s it. That’s all. It sounds so simple but the difference is so sublime. Sea Swirl has it right. The clam strips are actually sort of puffy here, rather than the tight knots you may be used to. 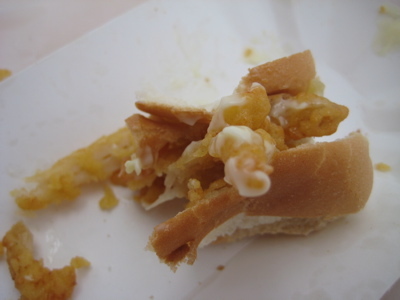 Of course, fried clams on a bun is a rather dry pursuit, so load on the tartar sauce and go to town. As you can see, that’s what we did. Some anecdotal evidence that the world is changing: We ate behind two women in their sixties (I’d guess). I eavesdropped enough to glean that they were retired teachers talking about the current state of education. To my slight amazement, they used the term “special needs” and talked about how abysmal the understanding of special needs was back when they began teaching. They traded tales of kids they had in their classrooms back in the day who clearly had issues, but were simply not treated as though they did. It was somewhat heartbreaking listening to them, and I almost butted in to offer my heartfelt thanks for their understanding. I think they were suffering from some guilt complex knowing what they know now. Anyway, chapeau! ladies. That’s my ear, but I took this picture because other dudes were posing for pictures behind me. That’s funny. We finished off our lunch with some ice cream. While it doesn’t make the Roadfood top ice cream spots, Sea Swirl does have a reputation as a good place for it. Unfortunately, I can’t even add it to my own list (here) which adds to Roadfood’s ice cream joints. For whatever reason, Damian’s strawberry scoop was awful. Just awful. It tasted like someone sabotaged the batch with old toothpaste or something. In other words, stick with the fried clams – whole belly if you’re so inclined – and you’ll be happily satisfied.